TNT recently released more information about the pilot for a new Dallas TV series. Unlike most other new incarnations of classic shows, this one will be a continuation of the original, not a reboot. 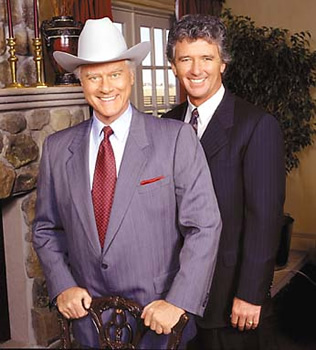 Larry Hagman, Patrick Duffy, and Linda Gray have all signed on to play their original characters. The new series will revolve around conflict between John Ross (Josh Henderson), the son of Sue Ellen and J.R., and Christopher, the adopted son of Bobby and Pam. Its unclear how much of the original series’ history will be incorporated into the pilot and (if it gets a greenlight) a new series. Producers would like to satisfy fans of the original but obviously wouldn’t want to scare off potential new viewers by overwhelming them with backstory. Still, with 14 years of history from the original Dallas, there are lots of storylines and characters that could be utilized in some way. J.R. had at least one illegitimate son that we saw during the series — James Richard Beaumont (Sasha Mitchell). At one point, he tried to keep J.R. locked away in a sanitarium and ended up moving back East to get away from his father. How about the return of Pam? When Victoria Principal left the Dallas, Pam was badly burned in a car accident with an oil truck. Pam later returned after plastic surgery, played by Margaret Michaels. The character eventually left the series because she didn’t want her loved ones to see her die of a fatal illness. Pam’s death is never actually mentioned or confirmed so presumably she could return. Word is that, in the new series, Bobby is remarried to a woman named Ann. How about Pamela Cooper, the daughter of Ewing longtime nemesis Cliff Barnes (Ken Kercheval)? Or, how about seeing the some of the Knots Landing characters again and perhaps their offspring? Surely there are more. What do you think? What older storylines would you like to see explored? Which characters would you like to see return? I would love to see KnotLanding come back. I sure hope that Dallas would consider adding them to the show. Or do another spin off again. Pam needs to come back. Please do your best to bring her back. Pam and Bobby belong together. No one else will do.